Sarah Chang. Photo by Cliff Watts. Sarah Chang performed the Barber with the Shanghai Symphony Orchestra. 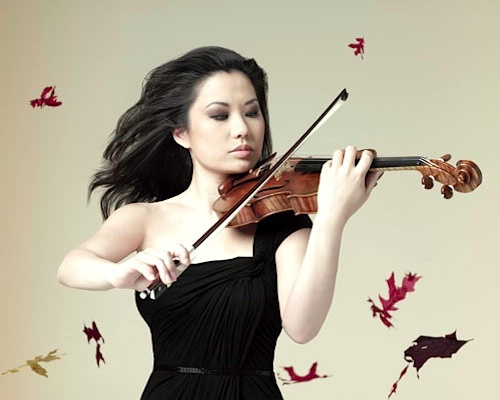 CCTV News: "As an Asian-born artist, I think Sarah Chang combines both subtlety and passion in the way she plays the violin. The concert was more vivid than I’d imagined," audience member Tang Yiyi said. Leila Josefowicz performed Esa-Pekka Salonen's Violin Concerto with the Los Angeles Philharmonic, with Salonen conducting. Los Angeles Times: "The performance Saturday night was on every level a sensation. " David Southorn performed Mozart with the Delaware Symphony Orchestra. The News Journal: "DSO concertmaster David Southorn jumped on Mozart’s fifth and last violin concerto with all the fresh enthusiasm of a kid in a candy store." Alina Ibragimova performed Haydn and Mozart concertos with the Academy of Ancient Music in its first performance at the new Milton Court Concert Hall. musicOMH: "… there can be few things more thrilling in a concert hall than to hear a soloist such as Ibragimova letting rip while still measuring out every sound and gesture to perfection." Nikita Boriso-Glebsky performed the Sibelius with the Bournemouth Symphony Orchestra. Portsmouth News: "Boriso-Glebsky, winner of the Sibelius Competition, was daring in playing the slow movement of the Finnish composer’s Violin Concerto truly ‘adagio di molto’ as marked. But he sustained his tempo so well that the musical line was never in danger of being lost and his command of the lowest level of dynamics was achieved without compromising tone-quality." Recording: Anne-Sophie Mutter plays the Dvorák. The Independent: "…a bravura performance of the Violin Concerto in A Minor whose opening 'Allegro ma non trope' illustrates the strengths of her technique and approach." Well, I received 2 CDs by mail through Amazon. Laurent Korcia's "Cinema" on the APM label did not disappoint. Also, a like-new copy of Dylana Jenson's Sibelius and Saint-Saëns, with the Philadelphia Orchestra and Eugene Ormandy on RCA Victrola: it remains spectacular.